Light driven movement is challenging in nonliquid environments as micro-sized objects can experience strong dry adhesion to contact surfaces and resist movement. In a recent study, Jinsheng Lu and co-workers at the College of Optical Science and Engineering, Department of Electrical and Computer Engineering, School of Engineering and the Institute of Advanced Technology in China and Singapore, developed a vacuum system and achieved rotary locomotion where a micrometer-sized, metal hexagonal plate approximately 30 nm in thickness revolved around a microfiber. They powered the motor (plate-fiber) using a pulsed light, which was guided on the fiber by an optically excited Lamb wave. The procedure enabled a plate-fiber geometry motor favorable for optomechanical applications in practice; results of the study are now published on Science Advances. Light can induce mechanical rotation remotely, instantly and precisely. 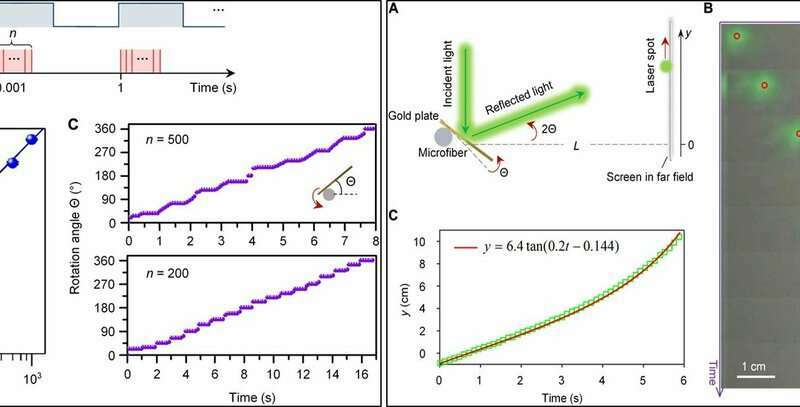 Light induced micro/nanoscale rotation can generate extensive applications in mechanical actuation, to manipulate biomolecules and deliver cargo. In liquid environments, scientists have demonstrated light-driven rotation by transferring linear and angular momentum to micro-sized objects. In nonliquid environments, dominant forces of adhesion prevent the motion of micro-sized objects. Since adhesion can seriously impede the operation of rotary motors actuated by momentum transfer, liquid is typically used to minimize unwanted impacts. In the present work, Lu et al. deviated from this long-held view to report on a light-actuated motor, where the forces of adhesion in air counterintuitively allowed rotation. The process was assisted by the Lamb wave (a thermo-elastic expansion generated by plasmonic heating of the absorbed pulse light) and the geometrical configuration of the plate-fiber. In the work, Lu et al. demonstrated a light-actuated micromirror with a scanning resolution of 0.001 degrees. They controlled the rotation velocity and stop resolution of the motor (gold plate on a microfiber) by varying the repetition rate and pulse wave in the setup. The scientists showed the motor crawl step-wise, with sub nanometer locomotion resolution in the experiment. The work offers unprecedented application potential to integrate in micro-opto-electromechanical systems, outer-space all-optical precision mechanics and controls, and as laser scanning for miniature lidar systems (light-based navigation/mapping systems). To construct the microfibers, Lu et al. used a flame-heated drawing technique and synthesized the gold plate containing a single crystal with an atomic smooth surface, in the shape of hexagons or triangles as previously reported. They then experimentally suspended the uniformly fine-drawn optical microfiber in air, or vacuum and placed the gold plate on it using a probe. They used scanning electron microscopy (SEM) imaging to view the plate-microfiber system. During instantaneous on/off movements of a continuous wave (CW) laser, the scientists observed subtly weak azimuthal movement of the gold plate. The movement was due to the expansion/contraction of the gold plate, the accidental effect triggered the pulsed delivery of a supercontinuum light into the microfiber. 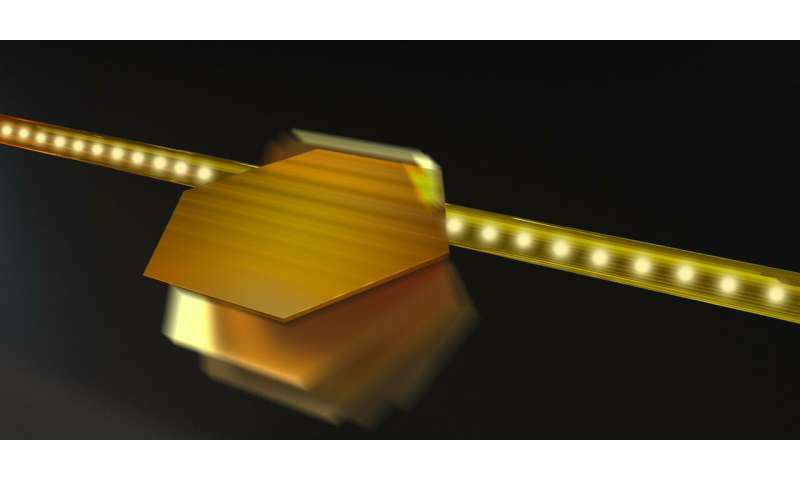 Using this process, the scientists showed how the gold plate revolved around the microfiber as the light pulses were guided into the setup where Van der Waals forces were responsible for the tight adherence of the plate to the microfiber. Incidentally, since the separation between the gold plate and microfiber was so small, the Van der Waals forces became dominant. When the scientists conducted the same experiment in liquid, the forces of adhesion became smaller, in this instance the gold plate moved away from the microfiber and stopped rotating, showing the necessity of adhesion forces for motion in this setup. The motor also worked in vacuum, where the gas pressure was about nine orders of magnitude lower than in air. The rotation speed was linearly proportional to the repetition rate of light pulses and increased linearly, to show that a single light pulse could actuate the motor to rotate at an extremely fine angle. Lu et al. used a waveform generator to produce a signal that could trigger the light source to emit a specific number of pulses and calculated the angle between the microfiber and plate using the projection method. Each light pulse actuated the motor to rotate at a constant angle. The scientists confirmed this result with further experiments. The scientists ruled out optical forces as the driving force during rotation, since the use of CW laser sources of different wavelengths did not cause any rotation to occur; only a pulsed light source with a single wavelength (1064 nm) could drive the motor to rotate. Indicating that pulses played an essential role to generate motion. 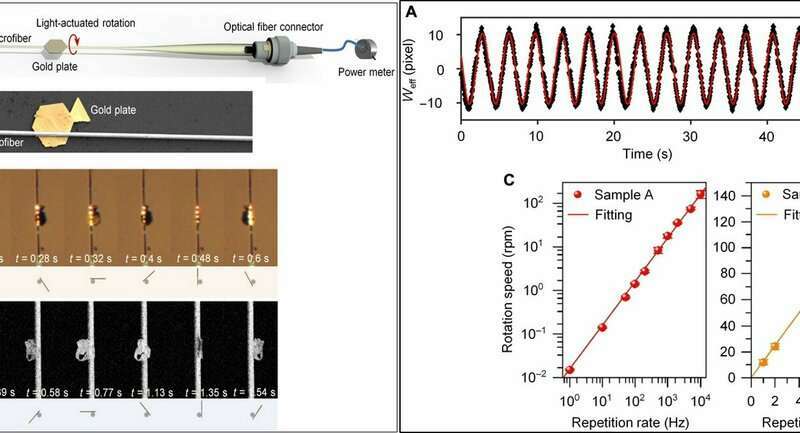 Previous studies had similarly shown that pulsed light could excite coherent phonons to induce lattice expansion and contraction, to propagate light-induced acoustic waves for many practical applications in optofluidics and bioimaging. The present results were specifically observed since Lu et al. generated a pulsed light-induced Lamb wave on the thin gold plate placed on the surface of the microfiber, to move the plate across the microfiber surface. They illuminated the phenomenon by explaining that first, when a pulsed laser is focused on a line on the surface of a light-absorbing film, surface acoustic waves known as Rayleigh waves can be generated. The pulsed light is then absorbed by the film to locally heat the surface, causing thermo-elastic expansion to generate surface acoustic waves that can clean adhesive particles on the surface. The Rayleigh wave and Lamb wave have similar patterns of motion, therefore, for instance, when the thickness of a film/plate is smaller than the wavelength of a Rayleigh wave, the Rayleigh wave will gradually transition to a Lamb wave. For additional insight into the mechanism, the scientists conducted finite element coupled thermal and elastic simulations. The results confirmed the experimental outcomes and indicated that the propagation direction of the Lamb wave generated in the plate-microfiber system was independent of the direction of light propagation within the microfiber. Lu et al. propose using the nanoscale motor thus developed in a variety of fields including micro-opto-electromechanical systems in outer space, during energy conversion and in vacuum high-precision mechanics. The rotating plate can also be used as a scanning micromirror to deflect a laser beam as shown in the study, for laser scanning in miniature lidar systems to map the world in 3D or as laser display systems and optical modulating/switching for integrated microsystems. The new discovery of light-actuated locomotion can open a new era of optical driving and manipulation at the sub-nanometer resolution of locomotion for controlled motion. The work will allow physicists and materials scientists to explore the new landscape of optical nanomanipulation in environments that require a new paradigm, beyond the existing liquid-based function. More information: 1. Nanoscale Lamb wave–driven motors in nonliquid environments advances.sciencemag.org/content/5/3/eaau8271 Jinsheng Lu et al. 08 March 2019, Science Advances. 2. On Waves Propagated along the Plane Surface of an Elastic Solid londmathsoc.onlinelibrary.wile … .1112/plms/s1-17.1.4 Lord Rayleigh, November 1885, Proceedings of the London Mathematical Society. 3. On waves in an elastic plate royalsocietypublishing.org/doi … .1098/rspa.1917.0008 Horace Lamb, March 1917, Proceedings of the Royal Society A. 4. Light-driven nanoscale plasmonic motors www.ncbi.nlm.nih.gov/pubmed/20601945?dopt=Abstract Liu M. et al., 2010 Nature Nanotechnology.